Here at Bailee's Beauties we think of our pigs as members of our family. This page is dedicated to the members of our cavy family that have sadly passed away. One day, while browsing the local petco I came upon a cage of guinea pigs. There in that cage I saw Kirby. At the time she was just a adorable 6 week old baby. After a couple months of living with us she was sure to become a queen. Once I saw her I knew she was the pig that I wanted. We were quick to tell the people that we wanted her. We bought her and happily left not knowing how truly wonderful this little furry ball of joy would be. When having her out for one of our countless play times we noticed that her eye was draining slightly. It was very small so we decided to keep a close eye on it. The next day she appeared better. She had never stopped eating, was drinking as usual, and still perky. Her eye had not been draining that day so we thought, "Hey! She looks great!" While examing her eye before going to a Christmas dinner I noticed that it had what looked to be a small scrape. I started researching like crazy before we left. From what I had read it sounded like conjunctivitis which is said to clear up quickly. 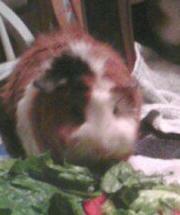 After reading that I put her back in her cage and added some lettuce and new hay. When we had gotten back that night she looked worse. Her eye wasn't looking good so I decided to clean it again and call the vet as soon as they opened. I called the vet and had an appointment made to immediatly bring her in. By that time she had stopped eating, and looked terrible. The vet said that it actually was a URI (upper respitory infection). She said that since guinea pigs are prey animals they know how to hide sickness amazingly well. Unfortuantly it had taken so much of her strength away that we just couldn't save her. We sadly had to put her asleep. I want to thank our veternarians at Animal Care Center. They were so nice and helpful in our time of grief. We received a beautiful heart shaped stone that had her name with 2 of her pawprints. A few days after it happened we received a card in the mail from the vets office. All of the staff has signed it and written little notes to us telling us how wonderful our care to her had been. They had not only helped us through our time of loss, but advised us even more on care for our pigs. They are a truly wonderful veternarian office. Kirby changed our outlook on guinea pigs. She showed us how much joy they could bring to a home. Getting to have her was a truly amazing experience. She will be missed by everybody in our family.